A Senate inquiry is looking into the challenges facing grandparents raising their grandchildren, and how they might be better supported. At a time in their lives when they may have envisaged retiring and taking things a little easy, some Australian grandparents find themselves raising their grandchildren. How many is unknown, as often they enter into informal arrangements with the children’s parents who might be dealing with mental illness, substance abuse or family violence. Abuse and neglect, homelessness and illness – just some of the reasons why grandmas and grand-dads find themselves caring for their grandchildren. Grandparents from migrant or refugee backgrounds who take on the responsibility of raising their grandchildren when parents are unable or unwilling to do so face unique challenges. Where grandchildren haven’t been brought up speaking the grandparent’s language of origin, for example, communicating successfully can be a struggle. Bluecare, which provides aged care services, recently consulted with migrant and refugee communities about the experience of grandparents caring for their grandchildren. It found many were afraid of the authorities and how their cultural parenting practices might be assessed. Some preferred to remain invisible. Bluecare’s multi-cultural advisor, Gaby Heuft, says the creation of a national peak body for grandparent carers could improve things. For Aboriginal grandparents who may have been forcibly removed from their families as children seeking help can be traumatic. Winangay Resources supports Aboriginal children and their families. The organisation’s Paula Hayden says it would like to see the provision of culturally-appropriate support services and assessments for Aboriginal kinship carers. Less than five per cent of children in Australia are Indigenous. Yet they make up a third of those placed in out-of home care. Ms Hayden says if appropriate support services were put in place, more Aboriginal grandparents could care for their grandchildren, and the incidence of out-of-home care could be significantly reduced. The Northern Territory has a high rate of teenage motherhood. And research shows young mothers are more likely to struggle in their parenting role, with grandparents often stepping in to provide care. The Territory’s Children’s Commissioner Dr Howard Bath Aboriginal grandparents caring for the children of teenage parents are in despair, and suffering from exhaustion. He suggests the burden on grandparents might be eased if there were more programs to improve the skills of young parents. The costs associated with raising children pose another challenge for grandparents. 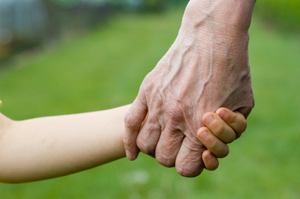 Grandparents in formal caring arrangements organised through child protection services receive a kinship care payment. Grandparents in informal caring arrangements don’t. They have to apply to receive fortnightly Centrelink child support payments. And the NT Children’s Commissioner Howard Bath says many are reluctant to do so. Grandparents in informal caring arrangements are also unable to claim family tax benefits. COTA Australia, which represents the rights and needs of older Australians, cautions that lack of financial assistance may discourage grandparents who see their grandchildren at risk intervening early. Its Chief Executive, Ian Yates, says many grandparent carers are under immense financial strain. COTA Australia says it’s heard of grandparents seeking to formalise their custodial arrangements through the Family Law Courts facing legal bills running into tens-of-thousands of dollars. It says the high cost of legal action puts it beyond the reach of many grandparents, and they’re forced to continue in insecure informal care arrangements. Ian Yates says Australia’s legal aid system should be reviewed to give grandparents improved access. But Dr Howard Bath says it’s not just financial support that grandparents in informal caring arrangements are missing out on. Grandparent advisers are available at some Centrelink offices to support grandparents with full-time caring responsibility for their grandchildren. But there are just six nationwide. Bluecare would like to see the contribution of grandparents raising their grandchildren recognised, with the creation of a national Grandparents’ Day. Multi-cultural advisor Gaby Heuft says the remarkable job they do should be acknowledged. Can I See My Grandchildren if their Mother Says "No"?